South West view of St Nicholas Church in Landwade, on the Cambridgeshire/ Suffolk border. Landwade is one of the smallest parishes in Cambridgeshire. 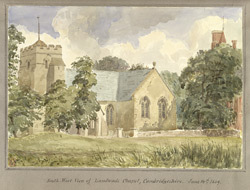 The church is located very near the moat of the old Tudor manor house of Landwade. It was built in c.1445 for Sir Walter Cotton, the Lord of the Manor, as his private chapel. The Cotton family took responsibility for the upkeep of the church up until the 19th century, when they sold the estate. There are many tomb monuments inside the church for members of the Cotton family. The building itself is of flint and has nave, transepts and chancel and a low two stage west tower. This view shows the south transept and the nave's south porch The tracery is Gothic Perpendicular style but the 15th century glass in windows was removed in the 19th century. The church however retains its 15th century roof.